Okay, I'm now officially a John Ioannidis fanboy. You might have heard of Ioannidis. In 2005 he published the notorious and elegant "Why Most Published Research Findings Are False". But what he has been up to recently, I wondered, and went to his homepage. Just reading the titles and abstracts of his recent publications was a pleasure for a nerdy, stats-loving skeptic like me! Let me share just one: Schoenfeld and Ioannidis 2013: "Is Everything We Eat Associated with Cancer? A Systematic Cookbook Review". Schoenfeld and Ioannidis chose recipes at random from a recent cookbook and compiled a list of 50 ingredients used in those recipes (almonds, bacon, baking soda, bay leaf, beef, bread, butter, carrot, celery...). Then they searched the medical literature for evidence that the selected ingredients were associated with cancer. For 40 of the 50 ingredients, there was at least one study. 39% of published studies concluded that the ingredient was associated with an increased risk of cancer; 33% concluded a decreased risk; 5% concluded a borderline risk; and only 23% found no evidence of an association. Of the 40 ingredients, 36 had at least one study claiming increased or decreased risk. Schoenfeld and Ioannidis do not conclude that almost everything we eat either causes or prevents cancer. Rather, they conclude that the methodology and reporting standards in the field are a mess. About half of the ingredients are exonerated in meta-analyses, but Schoenfeld and Ioannidis argue that even meta-analyses might tend to overstate associations given standard practices in the field. Oh, and here he is bashing the use of statistics in neuroscience. I guess I couldn't mention only one study after all. You know, because fanboys lack statistical discipline. One concrete edge of the site pictured above is (I just measured it) 38 paces; the other edge is 30 paces. Pythagoras tells me that the hypotenuse must be 48 paces -- 20 fewer paces through the grass than on the concrete. At a half-second per pace, the grass walker ought to defeat the concrete walker by 10 seconds. This particular corner is highly traveled (despite its empty off-hours summer appearance above), standing as it does along the most efficient path from the main student parking lot to the center of campus. There are 21,000 students at UCR. 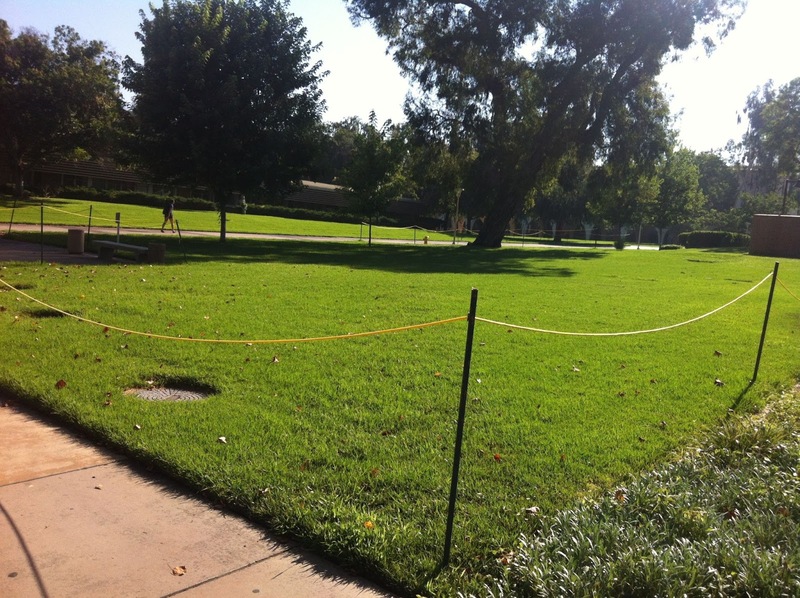 Assuming that on any given weekday 1/10 of them could save time getting to and from their cars by cutting across this grass, and multiplying by 200 weekdays, we can estimate the annual cost of forbidding travel along this hypotenuse at 8,400,000 seconds' worth of walking -- the equivalent of 16 years. Summing similar situations across the whole campus, I find lifetimes' worth of needless footsteps. The main reason for blocking the hypotenuse is presumably aesthetic. I submit that UCR is acting unreasonably to demand, every year, 16 years' worth of additional walking from its students to prevent the appearance of a footpath along this hypotenuse. Footpaths through grass are simply not that much of an eyesore. But even granting that unpaved footpaths are a terrible eyesore, the problem could be easily remedied! Suppose it costs $10,000 a year to build and maintain an aesthetically pleasing concrete footpath along the hypotenuse -- at least as pleasing as plain grass (perhaps including even an additional tree or flowers if necessary for aesthetic equivalence). To demand 16 years' needless walking from students to save the campus $10,000 is to value students' time at the unconscionable rate of seven cents an hour. These calculations don't even take into account UCR's costs of enforcement: The yellow rope itself is an aesthetic crime worse than the footpath it prevents! In light of UCR's egregious moral and aesthetic choices vis-a-vis footpaths, I am therefore entirely in the right to stride across the grass whenever I see fit. Raise the pitchforks. Fight the power. But I can't seem to do it while looking a groundskeeper in the eye. I imagine myself his Stoic student, listening to this speech, feeling thoroughly and rightly and personally rebuked. Although I reject the Stoic value system -- happiness under all conditions seems to me to require a problematic emotional disengagement from the world -- the passage beautifully connects two of my central interests: an approach to belief on which believing something is at least as much a matter of how one lives as a matter of what words come out of your mouth, and a practical, first-person approach to ethics that focuses on self-criticism and self-improvement. Do Women Have Different Philosophical Intuitions Than Men? Very interesting critique by at the Brains blog of the original Buckwalter and Stich study on this question. It is not a trivial question, Socrates said: what we are talking about is how one should live (Republic, 352d). "How should one live?" -- the generality of one already stakes a claim. The Greek language does not even give us one: the formula is impersonal. The implication is that something relevant or useful can be said to anyone, in general... (1985, p. 4). The generality of the question, Williams says, is part of what makes the inquiry philosophical (p. 2). Williams' thought seems to be that philosophy starts impersonally and then works its way back to the personal question as a particular instance. But I'm inclined to think that to begin with the general question is to set off in the wrong direction. Good philosophy is self-critical -- grounded in a sense of one's own capacities for critique and especially one's limits and biases. Before painting the universe in your philosophical colors, know the shortcomings of your palette. Yes, these are impersonal considerations for starting with personal reflection -- exactly what is needed to persuade someone inclined to start with the impersonal! A simple conversion of "How should one live?" to "How should I live?" is one way to go. But to the extent you're moved by the thought that it's best to start with self-critical evaluation, a different type of starting place beckons. For example: Am I a jerk? If yes, I should probably shut up about how others ought to live and work on myself. Being a jerk is not only a moral failing, but -- in my analysis -- also an epistemic one, a failure properly to appreciate the perspectives of others around you. A jerk ethicist not only is likely to be viewed by others as hypocritical or noxiously self-rationalizing but also works, I suggest, with an epistemic disability likely to taint his conclusions. If I am part-jerk, then my next thought maybe ought to be whether I'm okay with that; and if I'm not okay with that, what might I do about it -- a very different line of thought, and a very different plan for self-adjustment than is likely to arise from impersonal reflection on how one ought to live. Similarly, I might reflect on: "Am I a loving husband? ", "Do I engage in lots of self-serving rationalizations?" You might object: Such first-personal questions carry presuppositions of exactly the sort philosophers should question, e.g., whether being a loving husband is a good thing to aim for. We should back up and consider the more abstract questions first, such as how ought people live in general. I reply: The answers to these more abstract questions also build in presuppositions, though less visibly to me the less light I shine on my own moral and epistemic failings. Such first-personal moral epistemology is difficult and uncertain work. If I aim at a critical first-person ethics, I must take a hard look in the mirror, and I must think carefully about the relation between what I think I see and what is really there. I must vividly fear that I am not the person I previously hoped and thought I was. This is a less pleasant task, I find, than the abstract task of figuring out how everyone in general should live, and a different kind of philosophical ambition. ... here. Open access, triple-blind review, good list of editors. Sounds good to me! Consider submitting. If the journal gets a good track record of excellent papers early on it could follow the path of Philosophers' Imprint into the upper reaches of philosophy journals. I'd love to see open access journals like this one someday displace journals operated by noxious entities like Springer. So I'm rooting for it and appreciative of the editors for being willing to dedicate their time to a worthwhile enterprise of this sort. I'm an introspective pessimist: I think people's introspective judgments about their stream of conscious experience are often radically mistaken. This is the topic of my 2011 book, Perplexities of Consciousness. Over the past few years, I've found the most common objection to my work to be what I'll call the Individual Differences Reply. The Individual Differences Reply challenges this assumption of underlying commonality. If people differ in their experience as radically as is suggested by their introspective reports, then no one need be mistaken! Maybe people did really used to dream in black and white and now they dream in color (see Ned Block's comment on a recent Splintered Mind post). Maybe some people really do see tilted coins as elliptical while others do not. There are two versions of the Individual Difference Reply, which I will call the Stable Differences and the Temporary Differences versions. On the Stable Differences version, people durably differ in their experiences in such a way as to render their reports accurate as generalizations about their experiences. On the Temporary Differences version, people might be similar in their experiences generally, but when faced with the introspective task itself their experience shifts in such a way as to match their reports. For example, maybe everyone generally has similar experiences 20 degrees into the visual periphery, but when asked to introspect their visual experience, some people experience (and accurately report) clarity while others experience (and accurately report) haziness. Here's how I think the dispute should be resolved: Look, on a case-by-case basis, for measurable brain or behavioral differences that tightly correlate with the differences in introspective report and which are plausibly diagnostic of the underlying variability. If those correlations are found, accept that the reports reveal real differences. If not, conclude that at least one party is wrong about their experience. Consider black and white dreaming. Theoretically, we could hook up brain imagining machinery to people who report black and white dreams and to people who report color dreams. If the latter group shows substantially more neural activity in color-associated neural areas while dreaming, the reports are substantiated. If not, the reports are undermined. Alternatively, examine color term usage in dream narratives: How often do people use terms like "red", "green", etc., in dream diaries? If the rates are different, that supports the existence of difference; if not, that supports the hypothesis of error. In fact, I looked at exactly this in Chapter 1 of Perplexities, and found rates of color-term usage in dream reports to be the same during the peak period of black-and-white dream reporting (USA circa 1950) and recently (USA circa 2000). Generally, I think the evidence often shows a poor relationship between differences in introspective report and differences in plausibly corresponding behavior or physiology. Sometimes there is no systematic evidence, but antecedent plausibility considerations suggest against at least the Stable Differences version of the Individual Differences Reply: It seems highly unlikely that the people who report sharp visual experiences 20 degrees into the periphery differ vastly in general visual capacity or visual physiology from those who report highly indeterminate shape and color 20 degrees into the periphery. But that's an empirical question, so test it if you like!